Upgrading to EFI used to be a complicated and intimidating affair, but not anymore. 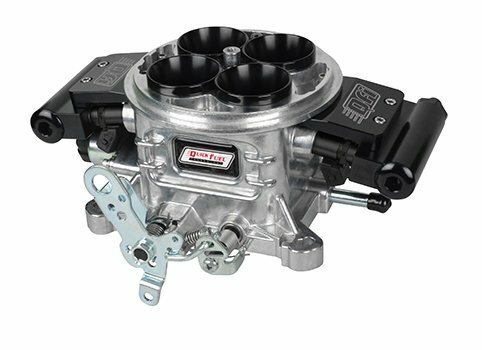 With Quick Fuel Technology’s self-tuning QFI™ system, anyone can install an EFI in a single afternoon. 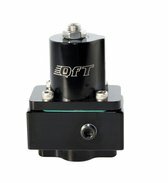 Whereas most aftermarket EFI systems on the market position the injectors below the throttle plates, QFi introduces fuel at the top of the throttle-body. Additionally, QFi’s patent-pending venturi sleeves utilize eight-hole annular boosters, thus creating a very large spray pattern and improving atomization. Increasing overall atomization efficiency and starting the atomization process higher up in the throttle-body yields enhanced intake charge density, fuel distribution, and cylinder filling. The result is increased torque and horsepower out, as well and improved throttle response. This is precisely why Formula One engines inject fuel as high up in the intake manifold as possible, and now QFi offers the same technology for the street. To improve idle quality and provide quicker cold-starts, QFi utilizes a separate idle circuit located below the throttle plates. In essence, this circuit functions like the transfer slot in a carburetor. The close proximity of the slot to the plenum combined with the additional fuel flow provided by the idle circuit allows fuel to enter the intake manifold very quickly. This nets instant cold starts and improved idle quality. QFi’s powerful ECU is more than just a fuel controller. Equipped with an on-board ignition driver, the ECU can control aftermarket capacitive discharge ignitions systems as well as HEI and ready-to-run distributors. QFi’s ability to create custom timing curves eliminates the need to install a costly aftermarket ignition box. Likewise, it enables a standard, non-programmable ignition box to function as a fully programmable unit. In contrast, many aftermarket EFI systems do not provide any type of ignition control capability whatsoever. Creating a baseline tune with QFi’s hand-held controller works great for the vast majority of engine applications. All you have to do is answer five basic questions regarding engine displacement, number of cylinders, injector size, number of injectors, and camshaft specs. After firing up the motor for the first time, the ECU immediately begins fine-tuning the engine calibration. Despite its simple user interface, the hand-held unit offers many advanced features such as electric fan control, and fuel enrichment control during cold starts, normal operating temperature, high temperature, and fast or slow throttle position changes. For more extreme applications, QFi allows fine tuning the volumetric efficiency tables of the fuel calibration by hooking the ECU up to a laptop. Quick Fuel Technology’s proprietary Dashboard tuning software is included with each QFi system. This fine-tuning software is particularly useful in engines with very large camshafts. Likewise, it offers room to grow just in case users upgrade to more aggressive modifications after installing the QFi system. Just like many new flex fuel late-model vehicles, QFi’s adaptive ECU is fully compatible with both gasoline and E85 fuel. As an alcohol-based fuel, E85 provides substantially cooler inlet air temperature than gasoline, which can yield horsepower increases in some applications. With QFi, taking advantage of the benefits offered by E85 is as easy as dialing in a richer air/fuel mixture through the hand-held controller. QFi is offered in either a polished aluminum or a Black Diamond PTFE coating. These finishes not only look great and resist corrosion, but they also reduce fuel temperature by six percent. Cooler fuel results in reduced intake charge temperature, which increases horsepower and torque.